I’d heard a lot about vegetarians using unripe jackfruit in the place of pulled pork because it can have the same texture. I had looked for canned jackfruit to no avail until a friend on Facebook (that most reliable of news sources) wrote that they had seen fresh jackfruit at 88 Ranch market in Temecula, a neighboring town. Off Miranda and I went. 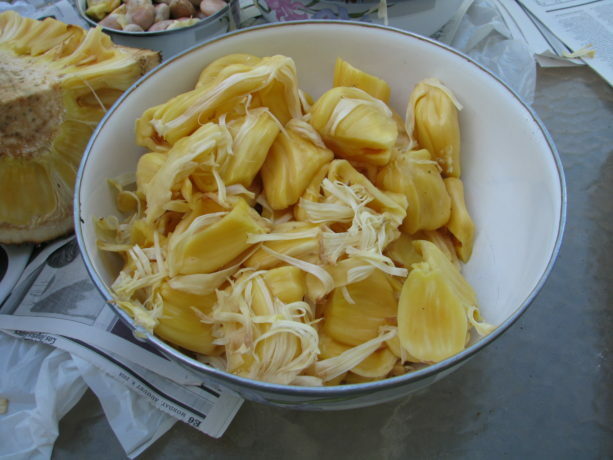 Not only did we find amazing and wonderful produce and mushrooms there, but we found the jackfruit. 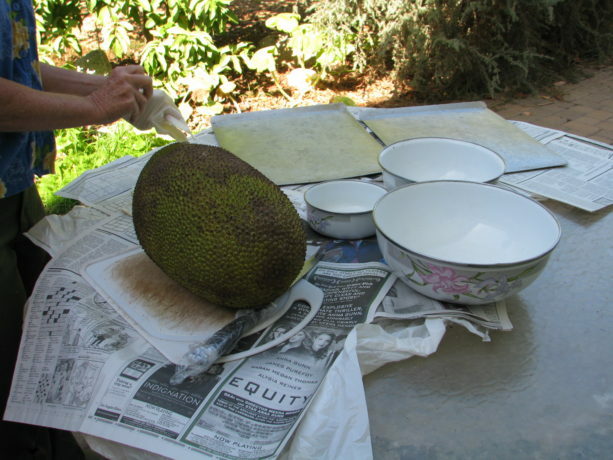 Jackfruit are the largest fruit in the world and are produced on the largest fruit-bearing tree in the world. The fruit can weigh 80 or more pounds. The more manageable one we purchased was a mere fifteen pounds. 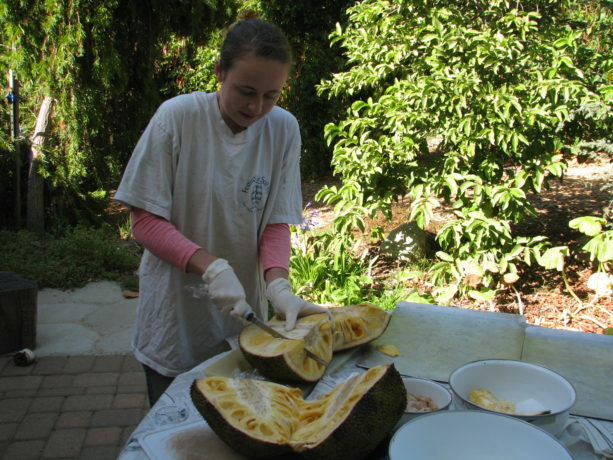 Jackfruit has latex in its core and stem, so butchering one (does one simply slice something that large?) requires some planning. We did it outside. Following Internet advice (which is always true and sound) (at least in this case it was) we spread out plastic with newspaper on top, covered our knife handles with plastic wrap, and used nitrile gloves. What I forgot to do was coat the knife blades with oil, but it all worked out okay. Indeed, the inside was amazing. 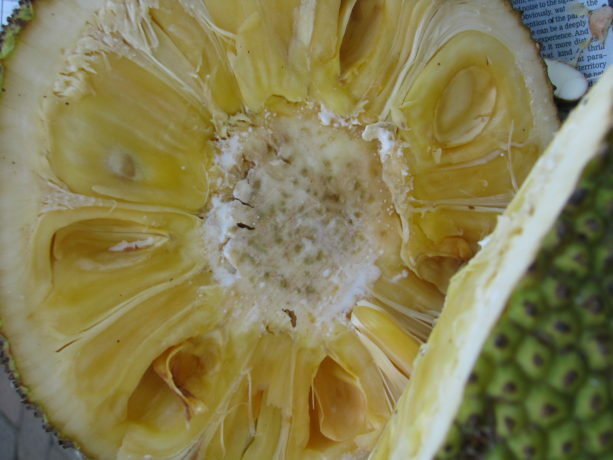 The core in the center of the fruit did weep white latex which we wiped away. This fruit was ripe, although the bumpy outside had been green. The scent was tropical and enticing. The fruit is actually the fleshy sections that surround the large seeds. This we tore out with our fingers. It was firm and yet soft, not mushy, and a light apricot color. The seeds are edible too. 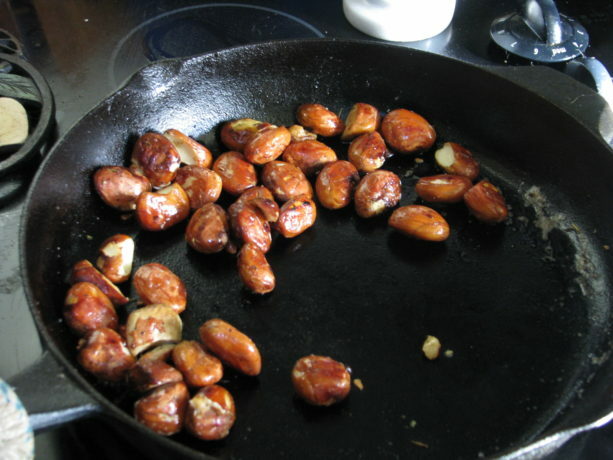 We boiled a batch, then had to slip off their protective coating then pan-roasted them, and they tasted like baked potatoes with the skin still on. We roasted more in the oven and they didn’t taste so great, but I think that was my fault not theirs. I planted several, and one sprouted and is now in the greenhouse about two inches tall and wondering how far he fell from the tree. The ripe fruit has a flavor that is both mango and pineapple. It is SO GOOD. As it wasn’t goopy or full of juice, the fruit was easy to deal with. 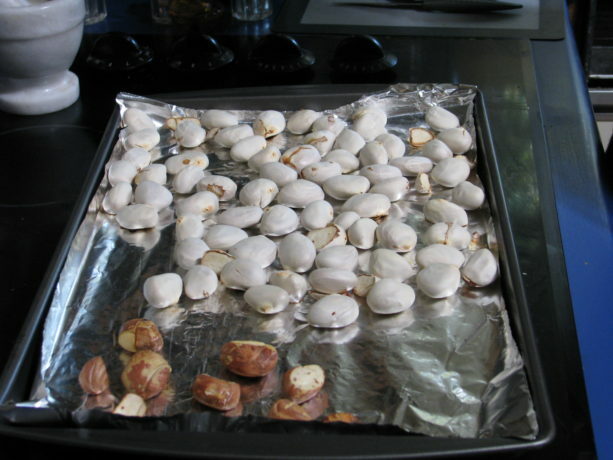 We lay most of it on cookie sheets, froze them and them put them in freezer bags. The frozen pieces taste like mango popsicles, and the fruit thaws without much change in texture; I brought some along for snacks on a trip. The part that is used for pulled pork is the fleshy parts that weren’t pollinated and didn’t develop a seed. They can be cut out and marinated. As this fruit had ripened, these parts had a bit of a fruity flavor to them, but we used it anyway. Clean up wasn’t as bad as we had thought. Throughout the process we had to switch gloves because the latex would make the fruit stick to them. The knife blades cleaned up after soaking in boiling hot water. We also bought the canned fresh and unripe fruit, but haven’t tried them yet. 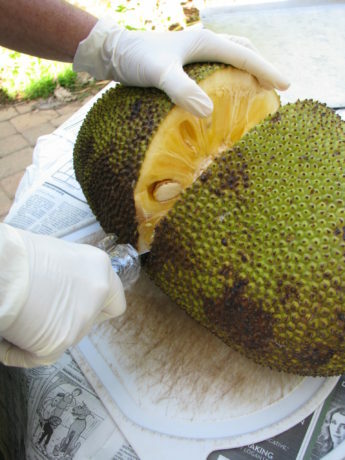 Jackfruit is mostly grown in Asia, but also has popped up in South America and even Southern California and Florida. 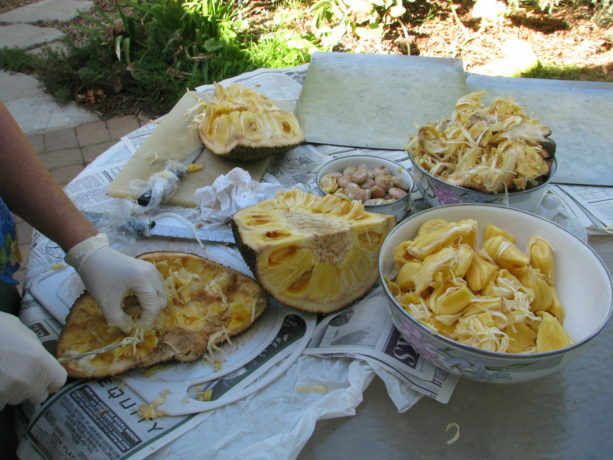 When jackfruit come back to the store, and the weather is warm, it will be a fine day for another butchering. Or I can wait for a decade for my little jackfruit sprout to grow up and shade out part of the Finch Frolic food forest and produce monster fruit. 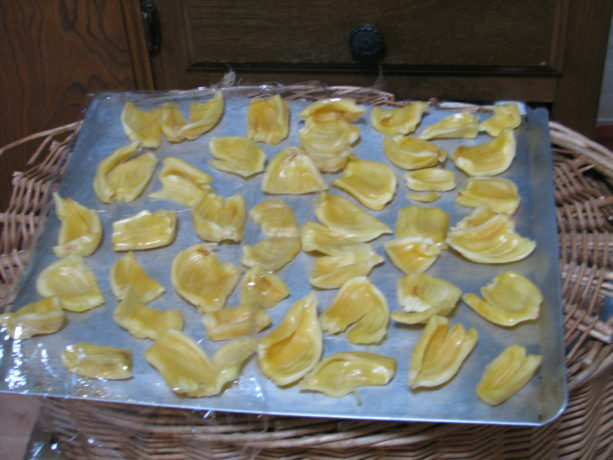 Until then we have really superb jackfruit pieces frozen on which to nibble. 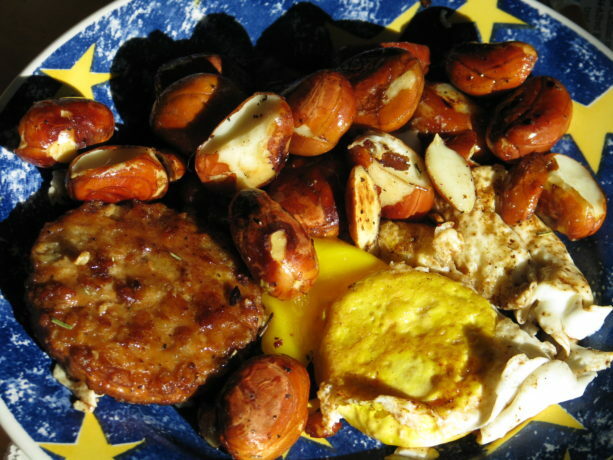 This entry was posted in Fruit, Gardening adventures, Permaculture and Edible Forest Gardening Adventures, Recipes, Seeds, Vegan, Vegetarian and tagged Fruit. Bookmark the permalink. 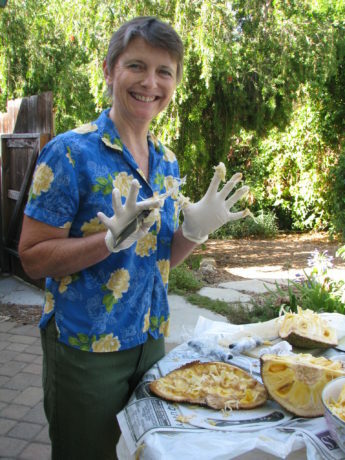 I’ve been so curious about this fruit and the vegetarian “pulled pork.” Thanks so much for your post!